So, that girl made it to the law ball after all. I knew I wanted to go, wanting to go wasn’t the issue. I wanted to go and have a great time with my friends and I didn’t doubt for a second that I wouldn’t enjoy my time with them. But it’s so difficult to ignore that voice. No matter how much you are enjoying yourself you can never fully ignore that voice in the back of your head. The one that whispers, ‘wow, those girls are so slim’. The one that murmurs, ‘wow, they’re so pretty’. I was dreading that voice before I went to the ball and although I tried to ignore it, I just couldn’t quite manage it. I felt beautiful before I went, but upon arrival that slowly deteriorated. I can’t help but look at everyone who is smaller than me and feel ashamed, wishing I was more like them. I can’t ignore that voice that compares me to them, making me feel embarrassed to be there. You can tell me I looked beautiful, you can tell me I was perfect but I won’t and can’t see it. I had a lovely time but every now and then that voice would creep into my head and start to make my heart feel as if it was about to split in two. People don’t realise that sometimes its the emotions you experience after an event that are the worst. In that very moment you are enjoying yourself, the people you’re with, the occasion you’re at, but when its finished, when you go home, when you’re lying in bed, the thoughts just go running in your head. Did I really eat that tonight? They were all so much skinnier than me. I’m going to be so fat in those pictures that get posted on Facebook tomorrow. I really hope I look alright in them. What if I don’t? What if I look so fat? But I am fat, so I’m bound to look fat. I’m going to look so fat. I’m going to be that girl in those pictures. My friends say I should be proud that I went. That I made the decision to go and I didn’t need them to persuade me to attend. I didn’t require their confirmation of how good I looked and I handled the night well. In some respects I agree with them. In some respects I do feel proud. I was so nervous to go, I was petrified of not being able to cope with the emotions in my mind but I did. Even though the thoughts came running, even though the thunder clouds came storming I coped with them as best as I could. I didn’t let the voice stop me from eating. I didn’t let the voice make me purge afterwards. And, most of all, I had and amazing time with my friends, which is the most important thing after all. I went morning training today for the first time since surgery and a friend told me I was brave for writing this blog. Brave in general. In that moment I didn’t believe him. I thought he was just being kind even though I still appreciated his words. But then I thought to myself. Then I realised something. I’m brave because, although I feel embarrassed, although I feel ugly and fat in my swimming costumes that feel tighter than usual, although I feel ashamed to be at the pool with the other, slimmer, swimmers, I still went. I still went training even though I knew I would experience those emotions that usually trigger the cycle and I went to the Law Ball even though I dreaded the same emotions. I’m brave because I knew those emotions and voices would enter my head. I’m brave because I knew they were coming and I still went anyway instead of staying home and hiding. I’m brave because I fought them, because although it hurt, although I was in so much pain, I didn’t let it trigger the cycle. I’m brave because I felt as if I was going to break but I refused to relapse. I am brave because I wake up every day and it breaks me to feel so fat but I still leave the house and do what I have to do. I am brave because I am scared of what people think of me, i’m frightened they’ll call me fat but I still go and speak to them anyway. I am brave because my dream of Rio feels like it has gone but I am still training. I am brave because I feel broken and I’m still trying to fix myself. I am brave because I’ve not given up. And I am proud of just how brave I am. 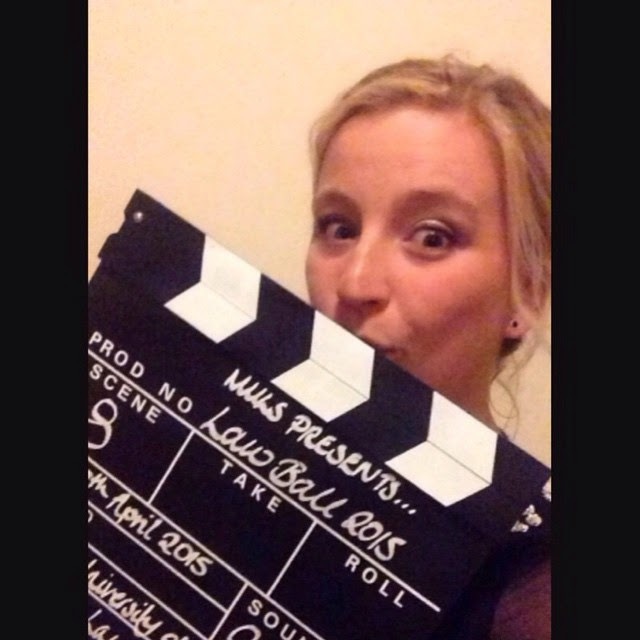 I even managed to pinch a little memento from the Law Ball, because at that time, I was so proud that I went. I was so proud of how brave I had been. And I am brave today; brave enough to post a picture of myself on here. Thank you Peter, for making me realise just how brave I am.